THERE’S NOTHING LIKE WINNING AN AWARD OR TWO…OR EVEN THREE! At Nanuya Island Resort we pride ourselves on providing a level of service and experience unequalled in the Yasawa Islands – that is our reward. While we enjoy a very strong level of support from the local and international tourism bodies, it is our relationship with both our guests and the people of Nanuya that matters. To receive accolades and acknowledgments from you, our guest, while providing work, income and support for villagers and families who call Nanuya home, is the keystone of our operation. 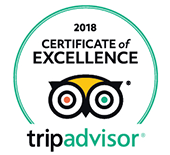 Check just a few of the wonderful reviews and endorsements below – they’re our awards and you’ll see why ensuring everyone who visits Nanuya Island Resort leaves with satisfaction level worthy of any award or reward. 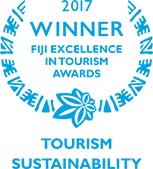 From time to time we also are recognised by our peers in various areas of resort operation and we’ll be sure to make these awards or acknowledgements public on this page. Send us an award by uploading a review on Trip Advisor – we’d love to hear from you. This was the best place we spent time at during our holiday. Ideal for couples, calm, you have privacy, the whole place is spacious. Staff is excellent and polite. There was no compulsory meal plan which was a big advantage for us (paid less for food during 3 days here than on another resort with meal plan during 2 days, even if the meals themselves were not really cheap). The beach of the resort looks nice, there is a small coral reef right in front and not far away another one which offer some snorkel opportunities. There are a good variety of activities as well. Our bure was good, not too spacious but enough. The only disadvantage is that the bathroom is open to wind which makes having a shower a bit uncomfortable in windy weather. What a wonderful find at the top of the Yasawa. Not only home grown organic produce but a sustainable resort in paradise. A big thank you to the owners Val and Ivan Parker for the tour of the resort and their hospitality. Their vision for creating a sustainable environment for tourists and locals is a credit to their hardworking ethos. Homemade breads and jams were a treat as were all the locally grown produce served in the restaurant. Water is plentiful as they have their own desalination plant and solar power is used. Accommodation in the deluxe villa was a perfect setting to relax and soak up the ambiance. The villas are beautifully finished with a lot of thought gone into the recently refurbished interior design. This will not be published - we may want to contact you in regards to your feedback. Dont tell anyone but NANUYA has a very special SECRET SANTA this festive season.